Facebook’s Instagram app is growing at a fast pace and contributing to the overall growth of the company providing optimism about its future potential. Total monthly active users reached 1 billion as of June 2018, up from 800 million at the end of 2017 and 600 million at the end of 2016. As of the end of 2017, Instagram’s daily active users stood at 500 million. This compares to 100 million at the end of 2016. The number of daily active users of Instagram Stories grew to 400 million in June 2018 from 250 million in June 2017 and 100 million in October 2016. 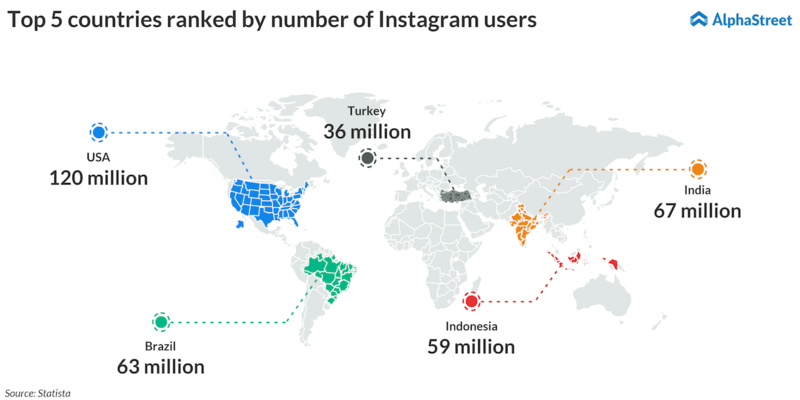 With 25 million Instagram business profiles and 2 million advertisers reported in the recently-concluded second quarter, Instagram remains on track for growth in the future. WhatsApp is another area of strength for Facebook. The company has seen growth in both monthly and daily users of the messaging app and is particularly focused on expansion in this area over the next five years. Facebook is testing payments on WhatsApp in India and the response has been positive. Worldwide monthly active users have grown from 1 billion in February 2016 to 1.5 billion as of December 2017. The number of WhatsApp users in the US was estimated at around 20.5 million in 2017, and this is expected to grow meaningfully over the next four years. The number of daily active users rose to 450 million in the second quarter of 2018 from 250 million in the second quarter of 2017. Snapchat’s daily active users have seen consistent growth sequentially, but its user base remains smaller compared to Facebook and its units. Daily active users stood at 188 million for the second quarter of 2018, reflecting an 8% growth from 173 million in the second quarter of 2017 and a 31% growth from 143 million for the same period in 2016. 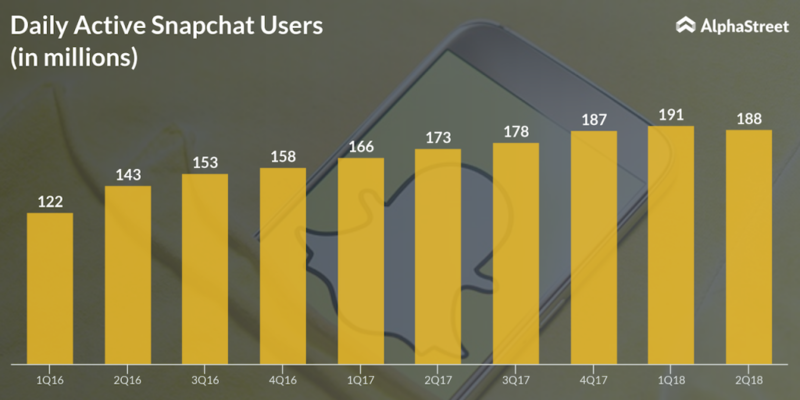 The number of users for Q2 2018 saw a 1.5% sequential decrease from 191 million users in the first quarter of 2018, which was the first time Snapchat’s user count had declined. This can be partially attributed to the privacy issues that affected all the social media companies earlier in the year. Snapchat does not give data for monthly active users but in 2016 the number stood at 301 million. Who will be the social media champ? For the most recent quarter, Facebook’s revenue grew 42% to $13 billion while Snap’s revenue increased 44% to $262 million. Facebook is way ahead and Snap has to take sufficient measures not just to catch up but also to bring in profits.